What is digital transformation? How does a business survive the digital age? BCG and University of Virginia experts tackle questions like these in their course: Digital Transformation. Get the inside scoop from course instructors Michael Lenox, Senior Associate Dean of University of Virginia’s Darden School of Business, and Amane Dannouni, Principal at The Boston Consulting Group. Michael: Itâ€™s become a buzz word thatâ€™s been created to capture technology and business shifts that are occurring because of digitization. Everything from changes in back-office processes as big data occurs, to The Internet of Things, and the implications of that for a wide variety of industries. The critical thing to know is that this is not your typical IT discussion of what information technologies a business needs. The course is more about how digital disruption is transforming products and services, business models, and the supply chain. What first sparked your interest in teaching a course like this? What excites me about digital transformation is the unpredictability. We know the past – what happened and at what speed, but we always fall short in predicting the future. The lack of predictably makes it a very exciting sector to be a part of. Who should be taking this course? Michael: People who are dealing with digital disruptions in their organization or who simply want to be more up to speed on some of the upcoming digital trends. I think you can find a wide variety of learners who might get value out of it. From business people to college students to retirees who want to learn about emerging technology. Amane: First of all, I want to stress the fact that I donâ€™t think digital transformation is a narrow phenomenon that will hit only industries explicitly relying on technology. Even industries like manufacturing and mining will be impacted. Itâ€™s very wide-reaching. I donâ€™t think knowledge of digital transformations should be reserved for upper management or constrained to the IT department either. It needs to be understood by people in every layer of an organization simply because it will impact everyone from the CEO to middle management, to the front line worker. This needs to be something everyone in the organization understands. Do you have any advice for businesses going through digital disruptions? Michael: You need to have an agile strategy. Youâ€™re not going to figure it out immediately. Itâ€™s going to be a learning journey. I recommend experimenting and making investments that help you learn. Building the processes that help you innovate and transform an organization is a key starting point. Itâ€™s putting a primacy on creating a learning organization that can adapt and is agile in the face of these agile and constantly evolving trends. How does a course like this help execute successful transformations? Amane: The course will address it in two different ways. The first way is getting everyone to understand the underlying trends: what technology has developed, whatâ€™s likely to happen in the future, and how these trends impact not only industries as a whole but individual companies. The second goal is to help business leaders understand how they can tackle digital disruptions. By this we mean, either ride the waves or control the risks that will face them. In the course, weâ€™ll talk about the different building blocks that learners can use to create their own digital transformation program. 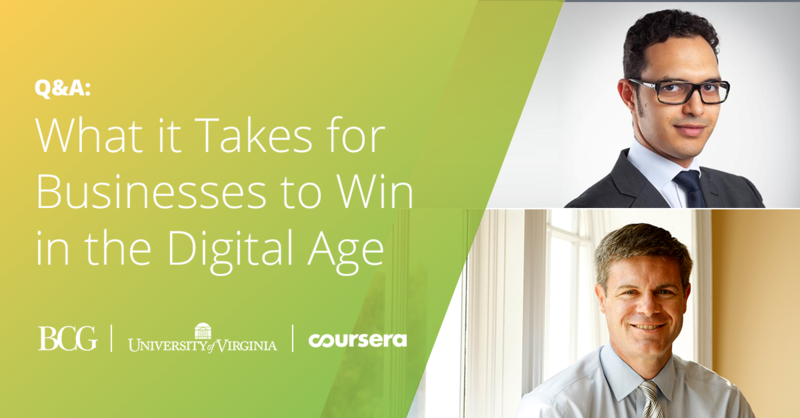 The post What it Takes For a Business to Win in the Digital Age appeared first on Coursera Blog.